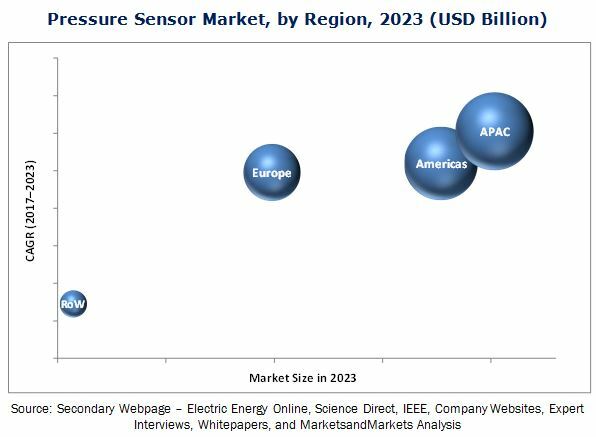 [149 Pages Report] The pressure sensor market is likely to witness high growth in the coming years, driven by advancements in MEMS technology and its rapid adoption in connected devices, growing demand from automotive and medical device industries, increasing adoption of pressure sensors in consumer goods and wearables, and stringent government regulations. The pressure sensor market was valued at USD 7.88 Billion in 2016 and is expected to reach at USD 11.30 Billion in 2023 with a growing CAGR of 5.27% during the forecast period. The base year considered for the study is 2016, and the forecast period is between 2017 and 2023. The objective of the report is to provide a detailed analysis of the pressure sensor market based on product type, technology, application, and geography. The report provides detailed information of the major factors influencing the growth of the pressure sensor market. Moreover, it provides a detailed overview of the value chain of the pressure sensor market. The players offering pressure sensors include Honeywell (US), ABB (Switzerland), NXP Semiconductors (Netherland), Infineon Technologies (Germany), Emerson Electric (US), General Electric (US), Siemens (Germany), STMicroelectronics (Switzerland), and Robert Bosch (Germany). This study answers several questions for the stakeholders, primarily regarding the market segments to be focused on in the next two to five years for prioritizing efforts and investments. This research report categorizes the overall pressure sensor market, based on product type, technology, application, and geography. The pressure sensor market is expected to grow from USD 8.30 Billion in 2017 to USD 11.30 Billion by 2023, at a CAGR of 5.27% between 2017 and 2023. The growth of this market is fueled by advancements in MEMS technology and its rapid adoption in connected devices, growing demand from automotive and medical device industries, increasing adoption of pressure sensors in consumer goods and wearables, and stringent government regulations. Developments in the pressure sensor market ecosystem through organic and inorganic growth strategies, such as product developments, merger and acquisition, partnerships, collaborations, and agreements, further drive the growth of this market. Among the different product types, the market for differential pressures sensors is expected to grow at the highest CAGR between 2017 and 2023. Differential pressure sensors provide the difference between two pressure sources through two ports, allowing users to provide required pressure inputs to the device for measuring the readings. This flexibility offered by the device helps drive the growth of the differential pressure sensor market at the highest CAGR during the forecast period. The pressure sensor market for the optical technology is expected to grow at a high CAGR between 2017 and 2023 driven by the growing adoption of optical technology over other technologies. In places that are remote or experience very high temperature, optical pressure sensors are used for various applications. In applications where other technologies can fail due to electromagnetic interference, optical pressure sensors can work very well due to their immunity to interference. These sensors also work well in the presence of chemicals or explosive materials. Among various applications, automotive held the largest share of the overall pressure sensor market in 2016 owing to the increased use of pressure sensors in oil pressure monitoring, fuel pressure monitoring, nitrous pressure monitoring, transmission pressure monitoring, and tire pressure monitoring. Asia Pacific (APAC) is expected to hold the largest share of the pressure sensor market during the forecast period. The pressure sensor market in countries such as China, India, Japan, and South Korea is expected to grow at the highest CAGR due to the increasing deployment of automated storage and retrieval systems (ASRS) and rising awareness about the advantages of automated systems. The key restraining factor for the growth of the pressure sensor market is the intense pricing pressure. The consumers of pressure sensors are key players in applications such as utilities, oil & gas, consumer electronics, automotive, oil & gas, aviation, marine, medical, industrial, and others. The major demand for pressure sensors is from the automotive and medical applications. While both these industries are growing rapidly, they face a stiff price competition in the market. Therefore, the players in these applications demand low-cost pressure sensors to bring down the price of the final product. Key market players such as Honeywell (US), ABB (Switzerland), NXP Semiconductors (Netherland), Infineon Technologies (Germany), Emerson Electric (US), General Electric (US), Siemens (Germany), STMicroelectronics (Switzerland), Robert Bosch (Germany), TE Connectivity (Switzerland), Schneider Electric (France), Denso (Japan), Continental (Germany), Endress+Hauser (Switzerland), SSI Technologies (US), and Delphi (UK) focus on strategies such as product launches and developments, agreements, mergers and acquisitions, partnerships, and collaborations to enhance their product offerings and expand their business.